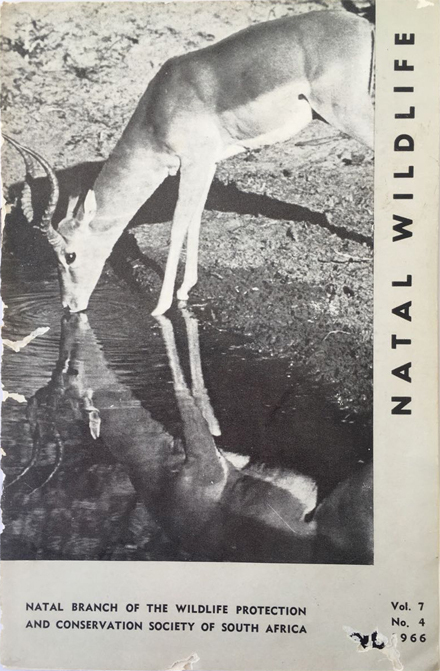 A subscription to the magazine of the Natal branch of the Wildlife Protection and Conservation Society of South Africa in 1966 was R3.15 annually, a life subscription was R 52.50. In volume 7, number 4 of that year the editorial entitled “Getting Giddy, Going Round and Round” bemoaned the progress of conservation strategies in country. In 1966 a Transvaal Provincial councilor, using almost the identical words, pleaded that the province set aside marginal land for game farming and that after 200 years, the ideas were the same but had not been implemented. In 1889, Dr. H.G. Fourcade complained that most of Natal’s coastal forests had been destroyed and that the remaining forests be declared reserves. In 1954 the Natal Wildlife Society attempted to stop bush destruction along the coast and in 1966 the Natal Fieldworkers surveyed the remaining patches of coastal forest and urged them to be proclaimed reserves. In the 1880’s a Natal botanist wrote: “When following the coast, the rivers of the Colony, crossed near their mouths, look as if they were streams of silt and debris as much as streams of water.” In 1954 the Natal Wildlife Society drew attention to the bad condition of Natal’s rivers, and started an investigation into the laws affecting them and the possibilities of improving them. The editorial ends off lamenting the path that conservation had taken in the country, a path that leads round and round in hopeless circles. Sparrman would certainly have been pleased with the turnaround in wildlife numbers since 1775. The radical concept of private ownership of rhino in South Africa, spearheaded by Dr. Ian Player, was the engine that drove the establishment of game ranching in the country. This saw wildlife numbers increase from less than a million head in the 1960’s to over 12 million on private land and a further 6 million in national parks today. The number of game ranches has increased from a handful in the 1960’s to approximately 10 000 with an annual value of 2 billion Rand to the South African economy. Not all is well however. Pressure on natural resources has increased tremendously with the burgeoning human population which in 1950 was around 13.5 million and is now about 54.5 million. Rhino poaching is decimating the national herd and a tipping point has probably been reached where deaths outnumber births. Contamination of rivers, dams and underground water supplies through slack control of mining operations is a major concern. Soil erosion, bush encroachment, a laissez faire approach to the management of national parks and the list goes on, are all serious conservation problems that we face. To further complicate things the animal rights philosophy has taken center stage, stifling any sensible discourse. And so, the editor of that magazine back in 1966 would probably contend that today we are in a downward spiral rather than merely going around in circles. Getting giddy would be preferable to the sickening vortex in which we are now trapped.